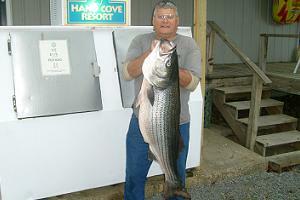 Hand Cove Resort is central to what has become some of the best fishing grounds of Norfork Lake. 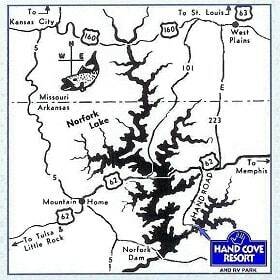 We are located on the Big Creek arm of the lake, about two miles east of the Norfork Lake Dam. 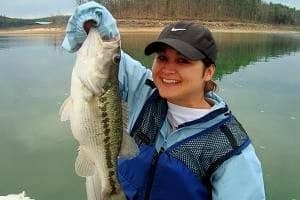 Many regular anglers have discovered that the undeveloped shoreline, varied underwater structure, deep water, and large amount of bait fish in this area of the lake attract a large amount of the Norfork Lake fish population beginning in early March, through the summer and into the fall. Structure. It’s mostly about structure and there is plenty of it in the Hand Cove/Jordan Recreation areas. 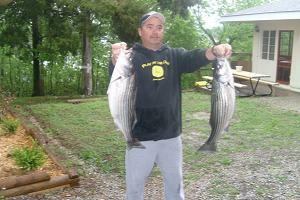 Fish the gravel flats and the high rock bluffs in the spring for those big Norfork Lake Stripers and bass. 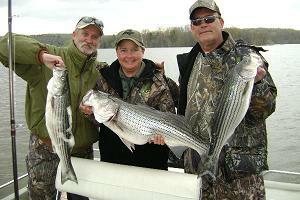 Keep an eye open for the walleye on the fringe of the striper schools. 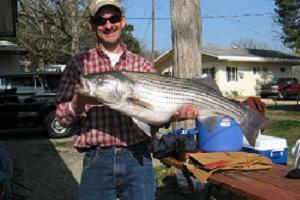 Big Creek and Brushy Creek afford opportunities for white bass and crappie all year. The numerous Arkansas Game and Fish brush piles in this area will give you plenty of pan fish action in the late summer and into the fall months. Recent high water spawns couple with extensive Arkansas Game and Fish stockings are turning Lake Norfork into one of the south's premier crappie lakes. You know those crappie like cover. We have the structure, brush piles, and boat dock cover to give you plenty of Lake Norfork crappie action in the later spring, later fall and early winter action. By the way, Lake Norfork does not freeze. It's No Ice, Ice Fishing in the south. The depth of water near the dam and then up into the Big Creek Arm and the Hand Cove/Jordan Recreation areas tend to run deeper in the channel middles than many other areas of the lake. 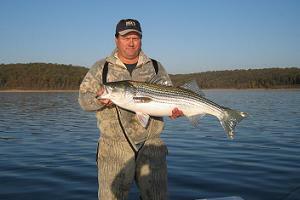 During the lazy summer and early fall days these cooler deep waters attract the big Norfork Lake stripers along with the other large species such as large and small mouth bass, hybrids, and those feisty white bass. The hot ticket activity during the summer…bass fishing under the lights. That’s right, bait up, throw the lights overboard, and get ready for some reel-ripping action. Gizzard and threadfin shad, Norfork Lake predator fish’s cuisine of choice, are plentiful in the Hand Cove/Jordan Recreation areas. Just get out there and keep an eye open. You’ll see them ball up and then boil. That’ll be the spot. Get on it! 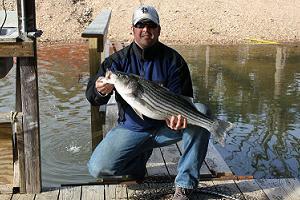 From early March until late May, this 5 mile length of Norfork Lake turns into The Striper Zone. 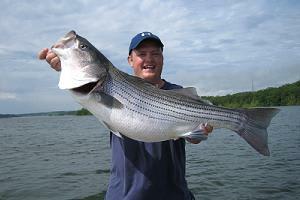 (That’s Striper, as in Striped Bass). 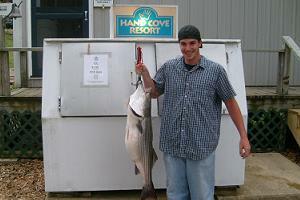 Hand Cove Resort is centrally located within the zone. From the headwaters of Big Creek and Brushy Creek to the Norfork Dam. From Jordan, Indian, & Catfish Islands, Barren Point, and Blue House Bluffs to Koso and Hudson Points, this is where the action’s at. Prime time is from 2 to 3 weeks before the April full moon until about 3 weeks after the May full moon. Plan on throwing suspending stick baits and lots of them. 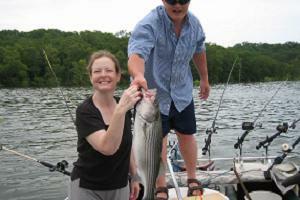 You'll find all of the Norfork Lake appropriate styles and colors in our tackle shop. And be sure to have a good top water. Live shiners are a good choice also. We stock 3 sizes for your convenience. 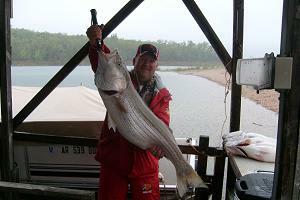 Live bait, Norfork Lake tackle, and maps on site. Electric outlets at each boat stall. Outside electric charging outlets on most cabins. Walk about 100 yards to your boat from your cabin. Unload at our dock ramps. Park in front of our dock. 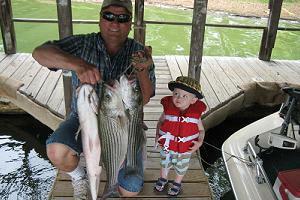 See your boat from many of our cabins. For your boat's protection our dock is in a protected cove. Fish the lake from our dock, or from our ¼ mile of shoreline. and RV Park LLC, All Rights Reserved.